The UN Human Rights Committee has registered a complaint submitted by Homel civil activist Mrs. Zinaida Shumilina, contesting a number of bans on holding pickets in support of former presidential candidates and their families. The complaint was submitted after none of the 16 pickets was sanctioned by the city’s executive officials. 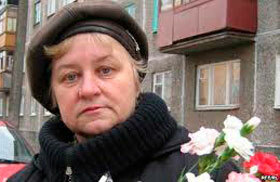 The bans were later upheld by the district court, Homel Regional Court, and the Supreme Court of Belarus. In her complaint, Mrs. Shumilina stresses that the city’s of Homel, with nearly 500,000 of population, has only one authorized location for holding mass events. Moreover, people are forced to pay for staging pickets and holding demonstrations. “We do not understand the reason why our right to holding peaceful assemblies to express our opinion was restricted. We believe that the bans on staging the events are not necessary for the national security, public order, or protecting the health, rights and freedoms of other persons,” says Mrs. Shumilina.